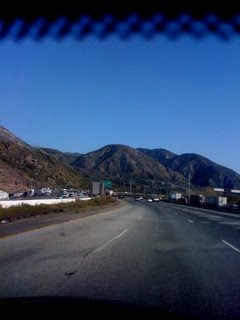 We are on our way to my parent's house in southern California and the hills are nice and green. Although I am feeling good, the car ride back is not very comfortable as I am crunched up in a small car and really "feel" every inch of the road. We are also stopping frequently to walk as per doctor's orders which just makes it take longer. I fly back Thursday so I will at least get one day in between without cramped travelling. This update is being made in the car via iPhone... Technology is cool. Hey Mike! Glad to hear things are still going Ok for ya. We made it back to AZ and Paul is doing well. We'll be following your Blog to watch you melt away! !